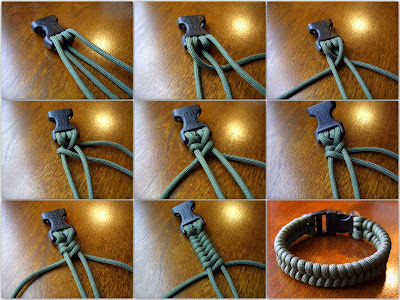 Stormdrane's Blog: Woven paracord bracelets, one strand two working ends. Here are three paracord bracelets made with the same weaving pattern(doing figure 8's with the two working ends), for the same wrist size(mine at 8.5"), but using different amounts of paracord by varying the number of core strands. 5/8" curved side release buckles are used on each one. You can see how they increase in size/diameter/thickness with the more cord used for the core strands. This applies to the other variations/methods of making paracord bracelets and even lanyards with attachments on both ends for the core strands to wrap around, like snap hooks, key rings, and carabiners. A 3/4" buckle will allow an 8 strand core, and a 1" buckle can fit a 10 strand core. In the past I've tried 1.5" and 2" sized buckles, but with so many core strands these just seemed way too bulky. I played around trying them with bracelet and belt versions but didn't personally care for the results(YMMV). Photo collage of weave process shown, after looping onto side release buckle ends. You can finish by sewing, melting, gluing, or tucking the ends(I used tuck method on this on). These next three photos show how the cords look when on the side release buckles before weaving, for the 2 strand core, 4 strand core, and 6 strand core paracord bracelets. The core strands are paired off and you take turns with the two working ends: left side working strand over one core and under the other, right side strand over one core and under the other. Repeat that left/right pattern until you reach the other end. Then tuck/pull the working ends under a couple of the previous weaves with hemostats or needle nose pliers, and trim the ends to finish. neat. i'm gonna have to try one of these soon. What is this braid/weave called? I'm not sure what a specific name for it may be, but it's just simple weaving method done around two strands/warps. A 'racking bend' or 'racking seizing' look similar, but serve different purposes. I added a photo collage of the weave process. You start out like you would for a regular paracord bracelet, attaching the paracord to the buckle ends and set to wrist size. Then begin weaving. 2 strand core is shown, but multiple is your option if you run the paracord back and forth between the buckles before you start weaving. Amazing!!!! I am so going to have to try this!!! is this all done with 1 piece of paracord, for the first example 1 8ft piece? how do you set it up before the weaving starts, between the buckles? Yes, each of the bracelets was done with a single strand. Starting them is done the same way as a regular cobra stitch/Solomon bar/Portuguese sinnet type paracord bracelet. 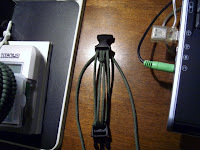 You can increase the amount of core strand cords by running the cord back and forth between the buckle ends when starting, as shown in some of the photos. The first one has just two core strands and is looped around each buckle end twice, to fill up the extra space. If a smaller 3/8" size buckle were used instead of a 5/8" one, there wouldn't be room to double up on the ends or run the cord back and forth multilple times before weaving. do you have a weave with black on the outside and blue in the center? I don't have any black or blue paracord at present, but you could tie it in those colors. With this method of tying, the core strands aren't really visible except where they're around the buckle ends. If you wanted to make one like that, you'd probably want to tie it differently than I've shown here, and follow another method. Ken has a tutorial on instructables for it being tied another way, with a similar finished look. Im absolutely fascinated by your blog & its projects. Thank you for posting them. I do have a question.. on some of the blog posts, when I click on the photos to see them larger, all I get is a tiny red box. Some blog posts work fine, however. Is this something wrong on my end? @Keshadei, I think Blogger is upgrading some features, so the images should be there when they get done. What book can you find this design from? Thanks! @Anonymous, This weaving pattern of paracord bracelet did not come from a book, I made it based on seizing racking/racking bend type of knotwork, and just applied it to side release buckles for bracelet use. Hi! I'm brand new to paracord bracelets and want to make the middle sized on you show here. Can you provide a formula for figuring out how long it should be, including the clasp? On Instructables you mention 1' for every inch of wrist. Is that the case with this weave also? And should that include the clasp? Thanks for answering a comment on an old post! @ptc, There's no set formula because there are too many possible variables, with different buckle sizes/brands, how tight/loose each person works the cord, and variances of paracord diameters from different sources. 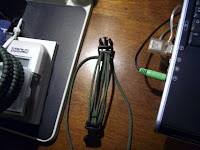 I used ITW Nexus 5/8" contoured/curved side release buckles for the examples in the blog post, but other 5/8" buckles may be longer/shorter which would affect the total amount of cord used. A smaller/shorter buckle may require more cord and a larger buckle less, maybe just meaning a few inches of cord, but if you're intent is mass production, that can add up over time, so take notes with how much cord you use to get closer to fixed formula, that will apply to the components you use. A thinner/flatter paracord will require a different length than a thicker/rounder length, again with probably just a few inches in difference in the finished bracelet. Thanks so much for your response, Stormdrane. I'm currently working on the woven bracelet/watchband in another of your instructables. Can you show how to do a three strand one? With the 6 strand, do the strands have to be flat side by side, or can they be scrunched together? @Anonymous, You can do them 'scrunched up' or flattened out side-by-side, whichever you prefer. @polarbear, look at instructions for the ladder rack knot and trilobite knots for getting that pattern with two colors. I myself figured this one out last week, before being forwarded to your blog. I searched a lot and never found any directions. So, I just tried to figure it out myself after having seen one of facebook. It is similar to a fishtail braid like used in the hair of many bikers, yet, since they are cords and not flowing strands of hair, it is a bit different. Love your tutorial, it is clear and easy to follow. I started mine with half of a square knot, but your start looks great as well. I first seen the center weave stich and it caught my eye but what I really liked is the bracelet weave itself. After days of searching I'm very happy to find your blog. You have a new follower. Thanks! One more question please. I noticed in the youtube video that the bracelet used, the black paracord seemed flatter than the one pictured here. Is that a different kind of cord or did you flatten it yourself somehow? Thank you. I was wondering if you have a video of the double center stitch band you made. I've been trying to do it but can't figure it out. If not, could you make one? Thanks. @Chuck, I've not done a video on tying the woven paracord bracelets, but there are tutorials by others on similar methods of tying that pattern with a single working end or two working ends, some with knot/loop closures, others with buckles or shackles. Here's one example from instructables. I know how to do the bracelet, I was wondering how to do the double center stitch with the 1.4 mm cord. I was able to do the single center stitch, just wondering how to do the double. @Chuck, Ah, the doubled stitching process is doing each 'V', double it then move on to the next. Start off like the single version, doing the left side then the right, then going back under and up along side again to the left to double that side, then under and up along the right, doubling it, then back under to do the next 'V' and repeat. Thank you! I'm working on the fishtail right now. I'll give it a shot. I made a tutorial for a two color version at Paracord central. I really like this design. Is it the same one used for your center stitched bracelets? @Marko, Yes, it is the pattern I used in the video demonstration for center stitching, but I've found stitching can be added to many different patterns that have horizontal running cord work down the center, so one is not limited on possible variations. Hi Stormdrane. I am new to paracord creations and I totally fell in love in this bracelet with those red stitches. I have ordered everything I need and is now waiting eagerly for everything to arrive. I will actually make a necklace for my dog ​​in the same pattern. It will be the first thing I do of paracord rope but definitely not the last. How do you start the woven style paracord? I can't tell from the pics how you've looped the cord through the buckle. In the pictures the cords are already looped through the buckles, but I can't tell how. Thanks. @Anonymous, The center of your length of paracord is looped onto the buckle ends with a cow hitch, also called a ring hitch or lark's head, once for smaller 3/8" or 1/2" buckles, or looped around again a second time for larger 5/8" buckles, and that's also called a Prussik knot. Once you're attached to one buckle end, you run the the strands down and around the other buckle end for wrist size, looped once or twice around the buckle depending on buckle size, then start the weaving process around the two strand core. 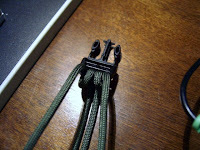 This is a common attachment starting method for many paracord bracelet designs that work around core strands. If you want four strand cores, you only start with the ring/cow hitch, then run down around the other buckle end, around two times for wrist size, then back up and around the starting buckle end again. For some 1/2" and 5/8" size buckles. For a six strand core, cow ring hitch, down around the other buckle end once at wrist size, back up and around the starting buckle end, then down and around the second buckle end again, gives you six strands to knot/weave around. For 5/8" sized or larger buckles. I have actually lengthened this into a belt. Since I have only one color (Camo Green), I plan to use some scrap inner strands of white to do some design work like your red/black bracelet. Thanks for the inspiration! Hi, stormdrane, first off thank you for all i've learned from your blog man, it fantastic, i want to learn how to make this design http://i.ebayimg.com/images/i/111008383670-0-1/s-l1000.jpg i haven't found it anywere and figured, if someone knew how to make it it was you, thanks for any help or info on it! From looking at the photo, it appears they are 'stitching' in the blue cord in a corkscrew type pattern on a bracelet that is already tied. Or they may work the cord in as they tie it. I'd tie the woven/fishtail bracelet first, then use a lacing needle with blue cord and do the corkscrew method to create the blue line effect down the center of the bracelet.